Today, people are thinking a lot more about office design, because it’s assuming a bigger role in the overall success of a company. For more and more businesses, today’s office trends are sparking vibrant creativity, true collaboration, and new ways of thinking. As the first quarter of 2019 comes to a close, let’s look at some office design trends that are expected to finish out the year strong (and continue well into the 2020s). Form follows function. Today’s technology is mobile and can be done almost anywhere. Common work areas foster collaboration and flexibility which often promotes creativity and innovation. It’s a brave new world. There are even new approaches to common office items like chairs. Want to see how a chair can excite? 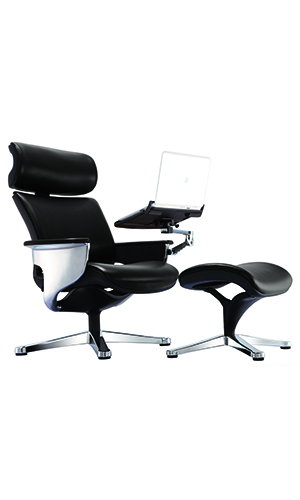 Check out Eurotech’s Nuvem™ chair with its three reclining positions and available accessories to integrate laptops, touch screens, and other mobile devices. 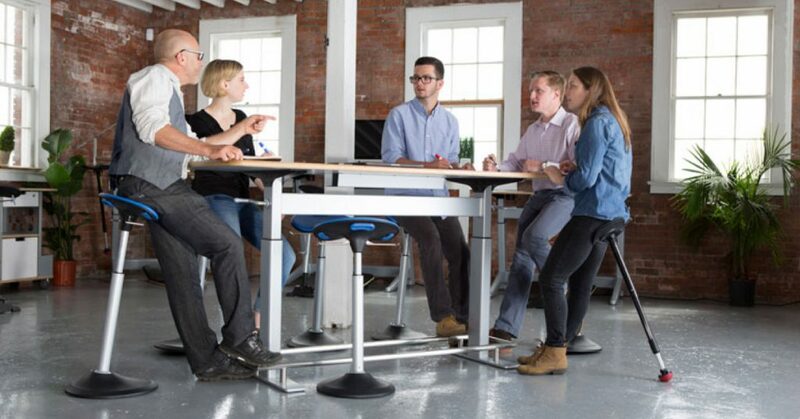 There are many benefits to standing throughout the day, and office furnishings like Lorell Furniture’s Height-adjustable Workstation Tabletop or Safco’s Locus™ Seat make that possible. Forward-thinking companies consider the total experience of the employee rather than just his or her work responsibilities and continually offer new approaches to foster individual and company wellness. In combination with common work areas, today’s hot office design trends offer common relaxation zones where workers can unplug, mingle, and refresh their energy supplies. Think about adding colorful, comfortable seating such as Safco’s Zenergy™ Ball Chair or Twixt© Active Seating Chairs. Be sure there are ample electrical outlets for charging electronics. Also, common recharge areas can be furnished with refrigerators, microwaves, and a nice selection of hot and cold beverages. Also, shared spaces mean shared seating areas. You may want to add a couple stylish and durable Tribeca Sofas from OfficeSource® throughout the open office. Corporate drab is over. “Business Beige” is no longer the go-to design-scheme color. Open, shared spaces and a renewed interest in the well-being of your workforce means creating a warm, inviting interior. You don’t need to be a designer to pair rich wall colors with modern design accents that support a full range of technological devices. Check out Hon’s fantastic Fabrics and Finishes to see how easy it can be to create a striking office look that meets today’s needs and holds up well. The line between home and the workplace is blurring. Employees are working more from home more and looking to find more homelike comforts at work. Accommodating this shifting balance is the primary office trend in 2019 and all signs suggest this inclination will continue. Successful companies will listen to what the primary design trend is saying. Having a modern, worker-focused office environment sends a message to current and prospective workers that people matter—as well as the work they do. Many times, your office can be reinvigorated by some simple changes. Give us a call and we’ll help you figure it out.